JESUS, Almighty God, Eternal - without beginning or end, Creator, Sustainer, and Highest King of the Universe, left the glories and joys of heaven and face to face fellowship with the Father, to begin the process of making all things new. JESUS, whom the Father appointed to bring justice for our sins with His death, lived sinlessly, performed miracles in which His creation immediately and completely submitted to His will and power - JESUS quieted storms, cast out demons, raised a man dead after four days, healed many with a touch, a word. JESUS, died. Then, JESUS, rose. JESUS, worthy of the highest praise - IS RISEN INDEED. JESUS, in His rising, obliterated the power of Satan. He conquered sin and death! JESUS, having been given all authority from the Father, has appointed us to proclaim this good news of His death in our place, for the forgiveness of our sins, making us new creations, if we will turn from our sin and to Him and His glorious grace, alone. JESUS, has appointed us to make disciples and to teach His followers to observe all of His commandments, which are always for our good and the good of others. JESUS, having loved us and the Father and accomplishing the Father's will, went back to the Father and the glories of heaven. He left the Holy Spirit as our Helper, who resides in us and sealed us as God's own, forever, so we cannot be lost to Him by any means whatsoever. JESUS, who now intercedes for us face to face before the Father when Satan accuses us; has also prepared a place for us in His glorious heavenly city and will return for us, at the end of the age, cutting off the greatest outbreak of persecution against the Jewish nation and His followers, of all time. JESUS, at His return, will send out His angels to gather and catch up His children - those who have died will go first, their bodies being raised, and then those who are alive at His coming will follow and all His own will meet Him in the air, being changed in a moment, given bodies, just like His resurrection body. Immediately following will be a time of wrath and judgment on the earth. Those left behind who are not protected by God and who give their worship and allegiance to a man who will declare himself as God when he stops Jewish sacrifices, will face destruction and death and will then be raised themselves, but not to eternal life in the wonderful presence of God, but to eternal separation, continuing in rebellion, experiencing forever darkness, alone, with unquenchable thirst, but not for God...for water that will never come. JESUS - we celebrate You, our Living Water! We honor You, our Great Shepherd! We exalt You! We magnify You! We proclaim You KING of Kings and LORD of Lords! WE LIFT YOU HIGH, ABOVE ALL THINGS! And we love You, and we thank You. And though we have not seen You yet, we live our lives by faith, by believing Your word and acting on it, no matter how we feel because we know it pleases You and produces a good result. Not perfectly, but as we seek You, we make progress. We worship You and we watch expectantly for Your return - when we will worship You face to face, forever, completely redeemed, and completely new. Death and tears, sorrow and sadness, gone. And we will walk the new earth with You, worshipping You, serving You, enjoying Your presence. It’s fun to wonder how Daniel ended up with a copy of God’s Word to Jeremiah…of course it was God’s provision, possibly brought by one of the other exiles, to this man who loved God and whom God esteemed highly. Jeremiah 29:1-3: "Now these are the words of the letter which Jeremiah the prophet sent from Jerusalem to the rest of the elders of the exile, the priests, the prophets (Daniel!) and all the people whom Nebuchadnezzar had taken into exile from Jerusalem to Babylon. (This was after King Jeconiah and the queen mother, the court officials, the princes of Judah and Jerusalem, the craftsmen and the smiths had departed from Jerusalem.) The letter was sent by the hand of Elasah the son of Shaphan, and Gemariah the son of Hilkiah, whom Zedekiah king of Judah sent to Babylon to Nebuchadnezzar king of Babylon..."
It's also worth noting these words which came later on in the same chapter - I'd given you verses 10 and 11, but verses 12-14 really caught my attention...Daniel read that God's people would call upon Him, and Daniel was the first! Because of the many sins of Judah, of not following in God’s ways, calamity had come upon Judah from God, by the hand of Nebuchadnezzar, King of Babylon. Not all at once, but at three different intervals, over a period of nineteen years, God’s chosen were removed from Judah and Jerusalem, taken by Nebuchadnezzar, and exiled into Babylon, for seventy years. Jeremiah prophesied to them again and again that it was going to happen. They did not repent and change, so God sent sword, famine, and pestilence by the hand of Nebuchadnezzar. Daniel was taken in the first deportation – in 605 B.C. 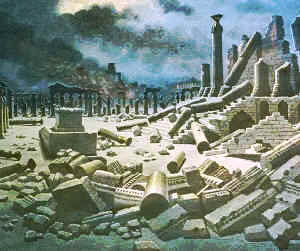 A second group was exiled to Babylon in 597 B.C. 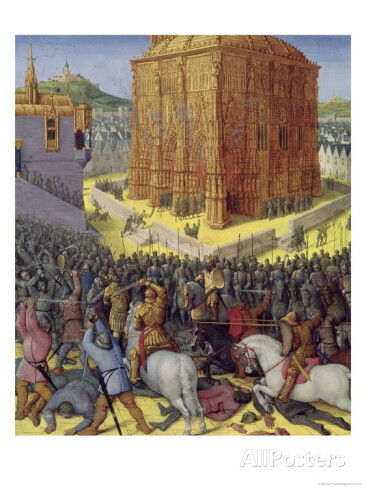 A year and a half prior to the final deportation which occurred in 586 B.C., Nebuchadnezzar’s troops laid siege to Jerusalem, surrounding it, not allowing commerce to go in or out during that time, bringing the people to starvation. Finally, the army broke into the city and Nebuchadnezzar’s officials came in and sat down at the Middle Gate – expressing full military occupation of the city. It was done. Nebuchadnezzar had overthrown Jerusalem. When King Zedekiah, along with his sons and his army, saw these officials take their seats, they knew it was over for them and they made a break out of the city at night. Nebuchadnezzar’s army took up the chase. When Zedekiah, his sons, and his army got to the plains of Jericho, Nebuchadnezzar’s army overtook them. Zedekiah’s army scattered but Zedekiah and his sons were captured and brought before Nebuchadnezzar at Riblah, his command headquarters. Zedekiah’s sons were slaughtered as he watched and then Zedekiah’s eyes were put out. He spent the rest of his life in darkness, in exile, in a prison in Babylon. A sad end for this disobedient king of Judah, who didn't listen to the word of the Lord from Jeremiah. Daniel was a student of the Word. Judah was now under the rule of the Medes (who God used to overtake and punish Babylon for their sins and ungodliness). Daniel was reading Jeremiah’s prophecy regarding the seventy years that Jerusalem would be laid to waste because of the sins of Judah. Daniel’s prayer is interrupted by an angelic visitor whom he had seen in an earlier vision. About twenty years ago, my extended family planned a reunion to Yellowstone National Park. It would start with all of us meeting at a resort just outside the park - accommodating those who loved to camp. Close-by was a motel where those family members who preferred the comforts of home could lay their heads for the night. The reunion lasted seven days, with different activities filling up the week. Three and half years into the final seven, the covenant with Israel will be broken by this prince - the world will be forced to choose to either worship this covenant breaker, or be put to death. The church will understand this covenant breaking as the revealing of Antichrist. He will be exalted by many who will worship him. For a portion of the last 3 1/2 years, he will bring the greatest tribulation the followers of Jesus Christ will ever experience. True followers of Jesus will choose imprisonment or death, and the nearness of Jesus in heaven under His altar, rather than bending the knee to this man, this false god of all false gods, who will bring great destruction. Israel will also undergo the greatest distress since her existence as a nation. 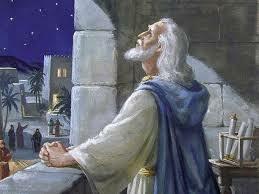 At some point before the end of Daniel’s 70th Week, Jesus will make His initial presence known, in the sky. He will bring great dread to those who worshipped the beast and He will end the persecution of His elect. He will resurrect and catch up all the Old Testament and New Testament saints. What remains for the rest of the Week is the period of time the Bible calls the day of the Lord. God alone will be exalted when He brings His wrath upon Antichrist and those who worship him. The surface of the earth and all the beast worshippers will burn with fire. At the end of the seven years the salvation and regathering of Israel back into the land will occur. The showdown between God’s enemies and Jesus also takes place, and Jesus wins, effortlessly. This is a study of a detailed summary of these events yet to come in these last 3 1/2 years of world history - taking scripture at face value, looking at some of the figurative language which describes that which will literally take place, and comparing scripture truth with scripture truth. After each paragraph, you will see a reference or references from which I pulled the truth I lay out before you. I encourage you to study for yourself. If you have embraced the gospel, if you have called upon Jesus for salvation, you have the Holy Spirit dwelling in you. He will illumine God’s truth. Your responsibility is to be a diligent student. Prophecy is woven all throughout scripture. God wants us to understand it. Confusion never lies with Him, but in our understanding of it. Studying future events enlarges our view of the One who loves us and gave Himself up for us. He is in control of everything. The more we understand His wonders and works and His character and plan, the more we will be in awe of Him. This awe brings our wills to surrender more quickly to His, and then He is worshipped and glorified. When we see Jesus as the Unseen (for now) Almighty Power moving behind the scenes of what is to unfold, yet always tenderly loving and caring for us, it motivates us to love and honor Him with our lives. We can and will grow in grace by studying and understanding what He has laid out in the things to come. Plans formed long ago, with perfect faithfulness." from one end of the sky to the other." to the farthest end of heaven." Who are the gathered elect in these two parallel verses? Are they the scattered tribes of Israel? Are they the church? Let's go on a scripture treasure hunt together. We'll begin in Matthew 24, and then we’ll move to two other passages in Matthew that also reference the end of the age. Finally, we’ll take a look at several other passages that parallel Matthew 24, because they also reference the coming of Christ - I think you will come to the same conclusion that I did. In Matthew 24, Jesus is speaking to His disciples about His “parousia”, and the end of the age. “Parousia” is translated as coming, in the NASB and ESV Bibles. From the Greek, we know it means presence. Jesus gives the events that will occur before His second coming, or presence. His disciples had asked Him what the sign of His coming (parousia) and the end of the age, would be. In a quick synopsis of Jesus' answer, He says the first big event to be observed prior to His parousia and the end of the age would be the abomination of desolation spoken of by Daniel the prophet, standing in the holy place (let the reader undersand) – v. 15. We know from the book of Daniel that this abomination, this detestable thing to God, will happen at the midpoint of Daniel’s 70th week - three and half years into the last seven years before Jesus sets up His kingdom on earth. It’s going to be a horrendous time of killing of those who love Jesus, and of the Jewish people, whom God loves. (Koloboo’, a derivation of kolazo’ in the Greek is translated as cut short in the NASB and ESV.) Jesus’ parousia, His coming with His angels, curtails the great tribulation. It ends this time of great slaughter. Jesus will turn the natural lights off (“the sun will be darkened, and the moon will not give its light, and the stars will fall from the sky…”) and then He will appear with His angels and they will gather the elect. vv. 30, 31. We are now at the end of the age. In Matthew 28, as Jesus gives what is known as the Great Commission, He tells the disciples that He would be with them, always, till the end of the age. Just prior to that He instructed His disciples to go and make disciples of all nations…included in that was baptizing them and also teaching them to observe all that I commanded you. So what Jesus commanded and instructed His disciples, is for each generation of disciples to learn and obey, and pass on to the next generation of disciples, until the end of the age. These words, including the Great Commission, are to us and for us - and He will be with us, always, till He returns at the end of the age. In the verses where Jesus tells the parable, He says the landowner tells his workers to allow both the wheat and the tares to grow together, until the harvest. The wheat might be uprooted with the tares if they tried to pull them before the harvest. At the harvest, the landowner will say to the reapers, “First gather up the tares and bind them in bundles to burn them up; but gather the wheat into my barn” – v. 30. When Jesus explains the parable, He identifies the Son of Man, Himself, as the sower. He identifies the wheat or the good seed as the sons of the kingdom (His true disciples) and He identifies the tares as sons of the evil one – who are sowed by the devil. Satan is trying, even now, to deceive the church by mingling his children with God’s. Then in the explanation, Jesus says the harvest is at the end of the age (when His “parousia” occurs) and the reapers are the angels. This is when the separation of the wheat and the tares takes place – Jesus’ true followers are gathered into the barn and the tares are gathered up to be burned. The wheat gathered by the reapers (angels) then would be the elect, or the true believers, gathered by the angels in Matthew 24. Looking at these three passages with references to the end of the age, I conclude that this is not the gathering of the scattered nation of Israel. That gathering will come after this gathering, after the close of this age. We'll look at that in another post. In Matthew 24, when the elect are gathered by the angels, we are seeing the true church being gathered, and, I think we are also seeing the resurrection of Old Testament saints and New Testament saints, as well. In 1 Thessalonians 4:13-18, the classic rapture passage, Paul, born along by the Holy Spirit, is revealing truth to us regarding…the “parousia”…the coming or presence of Jesus. Same use of the Greek word in Mt. 24. At the coming of the Lord, those who have fallen asleep (who have died in Christ), Jesus is going to bring with Him. He’s going to descend from heaven with a shout, with the voice of the archangel and with the trumpet of God. The dead in Christ will rise first, then, we who are alive and remain will be caught up together with the raised dead in Christ, to meet the Lord in the air. The word remain can also be translated as survive. (Strong’s Concordance - 4035.) We who are alive and survive (the great tribulation) will be caught up together with the dead who have been raised to meet the Lord in the air, and then we’ll always be with the Lord. Then Luke talks directly to believers, Jesus disciples, “But when these things begin to take place, straighten up and lift up your heads, because your redemption is drawing near.” Jesus is coming to receive us to Himself and to redeem our bodies. Romans 8:22, 23 references the redemption of our bodies which now groan under the curse. And 1 Corinthians 15. Here the Holy Spirit reveals truth through Paul regarding the resurrection. Christ is the first fruits…then at His coming (parousia – exact same Greek word used in Mt. 24), those who belong to Jesus will be raised – v. 23. Daniel 12:1,2 references Israel's time of greatest distress, greater than the Holocaust, and what follows then is resurrection of Daniel's people...”Now at that time Michael, the great prince who stands guard over the sons of your people, will arise. And then there will be a time of distress such as never occurred since there was a nation until that time; and at that time your people, everyone who is found written in the book, will be rescued. Many of those who sleep in the dust of the ground will awake…” Unprecedented tribulation and then resurrection, just like for the church. Matthew 24:31 says the angels gather from the four winds, from one end of the sky to the other. Mark 13:27 includes the farthest end of the earth. Therefore, based on the usages of "parousia" in Matthew 24, in 1 Thessalonians 4, in 1 Corinthians 15, and looking at the end of the age passages as well in Matthew 28 and Matthew 13, and if we include John 6 and Daniel 12:1,2, and the truth that the angels gather from the sky and the earth, my conclusion is this gathering is all the Old Testament and New Testament elect saints who are resurrected and the elect believers who are alive and remain at the end of the age. who will be able to teach others also." The word teach is defined as showing or explaining to someone how to do something. Everyone at some point in their life, has been a teacher based on this definition, even if just for a moment. How do you know you have the biblical gift of teaching? Whenever you read the Word, you want others to hear it, know it, and understand it. You want to explain it, and can explain it, with some clarity. You want to affect the lives of others for the glory of Jesus Christ, with His Word. You've been told by others that you have the gift. I have tried to shut down this blog, several times, but something wells up in me every time...the desire to proclaim Jesus and His Word, to explain it. The Lord determines the number in your audience, your call is to be faithful with your gift. It can be done on blogs, it is done in the church. To be clear, I believe the pulpit belongs to men, based on Paul's instruction to Timothy in his first letter. There he instructs that the overseers of the church are men (husbands) and able to teach - 1 Timothy 3:2. He also says in 5:17 that the elders who rule well, and elders are men, those elders who work hard at preaching and teaching (some will not work as hard at preaching and teaching) are worthy of double honor - Paul was talking about monetary compensation through the offerings. There are other verses too, that I base my position on, but these two verses are very clear that women are not to have the role of an overseer or elder, which is a position of leadership in the church, and one of their functions is teaching. Does God give the gift of teaching to women? Absolutely. I know many women with this gift of explaining scripture and they use it to teach other women and children. And I believe it's absolutely ok with the Lord for a woman to explain her understanding of scripture to a man - my husband and I have some great discussions around the Word from time to time. A woman can discern when error and heresy is taught, just as much as a man, if she's faithfully been a student of the Word, rightly dividing it. "The teacher is a link in the living chain which stretches unbroken from this present moment back to Jesus Christ. The glory of teaching is that it links the present with the earthly life of Jesus Christ." In every generation, God has raised up new links in this living chain of faithful men (and women) to pass on the good news of Jesus Christ to the people of their day. It is a privilege and joy to be a teacher of the Word. Even if you only affect one life at a time. As teachers, we are called to explain the Word, which stir others up about being in the Word, about being obedient, about being faithful, about doing good works out of love for our Master Teacher, about reflecting the character of our Master Teacher...the Greatest Teacher of All...the Lord Jesus Christ. for these words are faithful and true." God is making everything pristine, fresh, in mint condition. which is pure, righteous, and holy. Presently, His elect image bearers are new. "Faith is believing the Word of God and acting on it, no matter how I feel, because God promises a good result."